Since the season of holiday decorating is upon us, let’s start the month of December with a tale of two church officials trying to enjoy a well-earned cup of cheer after decorating St. Peter’s Church in Dorchester. 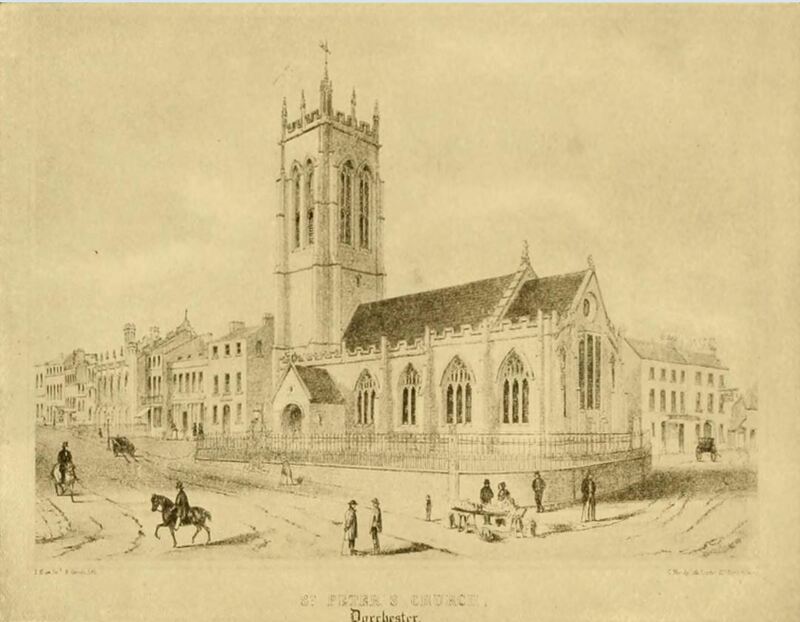 In the ancient town of Dorchester, Dorset, one Christmastide (I cannot fix the exact date, but it was not earlier than 1814, and might probably have been the following year), a rumor arose that a ghost had appeared in the old church of St. Peter’s to the clerk and sexton. They were both dreadfully frightened, and the former, I think, insensible for a time. The spirit was said to be the Rev. Nathaniel Templeman, the late rector, who died in 1813. The story reached the ears of the then rector, the Rev. Henry John Richman, a learned and intelligent man, genial and kindly (I have the pleasantest recollections of him). The action be took in this affair was attributed to his eccentricity, in which he certainly gave proofs in regard to some other matters. He had an invalid wife and sister-in-law, both very nervous; so, to avoid annoying them, he examined the clerk and sexton both together, and apart, at the house of my aunt. I was quite a child then, but can just remember the whispering and excitement, and the men being shut in with the rector. The particulars of the story I heard afterward. It was the custom in Dorchester, on Christmas Eve, for the clerk and sexton to decorate the church, not in the artistic fashion of modern times, but with large bunches of holly and mistletoe stuck about indiscriminately. Afterwards they gave the church a good cleaning for Christmas Day. On this Christmas Eve, the clerk and the sexton, after locking the doors of the church in order to prevent the intrusion of curious persons, busied themselves, as usual in Christmas preparations until the winter day drew to a close, when they sat down, on a form in the north aisle, to rest from their labors. Shute Haye, Walditch, Bridport, Eng. So many details turn this into an M.R. James story: “no sound of steps,” “turning round occasionally with the same awful look,” and melting into the family vault. While I can’t find a Clerk Hardy in the online parish records, Ambrose Hunt and Thomas Hardy are listed as witnesses at a number of weddings conducted by Mr Richman. I wonder if there is any link to the novelist Thomas Hardy, who, with architect John Hicks, helped restore St Peters in 1856-7? Hardy’s father, also named Thomas, was a violinist in his village church choir and a stone mason. It would hardly be a stretch, since the novelist was fascinated by the supernatural, to find that his father had met the rector’s ghost. But perhaps the name was a common one in the area.